Front row (left to right): 1. Jeff ..., 2. Larry DiPietro, 3. Victor Trigger, 4. unidentified, 5. Bill Patterson, 6. Brent Davies, 7. Stepen Patrick, 8. Wes Parley, 9. unidentified, 10. unidentified. Second row: 1. Carol McDonald, 2. Eleanor Bonner, 3. Jane McNeely, 4. Christine Murphy, 5. Kay Skevington, 6. Marie Aiken, 7. unidentified, 8. Pamela Meyers, 9. Elaine Garcia, 10. unidentified, 11. unidentified. Back row: 1. Pat Lyons, 2. Darrell Irivng, 3. Gerald Hicks, 4. Philip Eckert, 5. unidentified, 6. unidentified, 7. Elaine Meyers, 8. Danny Barr, 9. unidentified, 10. Donald Skinrood, 11. John Cary, 12. Ralph Satter(sp). Standing behind her class: Mrs. Timmons. Credits: From the collection of Phil Eckert. The kids in the picture are members of the high school graduation class of 1969. To find other pictures of the class of 1969 in the archive, see Livermore class pictures listed by year of high school graduation. And if you have any pictures of the class of 1969 that you would like to share, please submit them to the Archive. 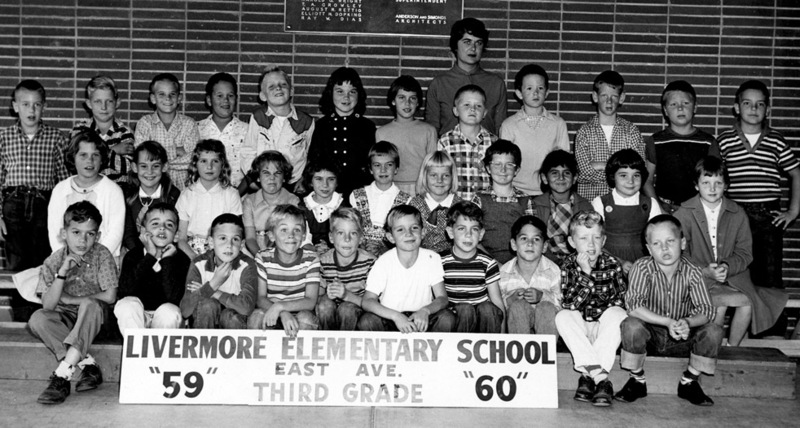 To find other pictures from East Ave School in the archive, see Livermore class pictures listed by school. And if you have any pictures from East Ave School that you would like to share, please submit them to the Archive.